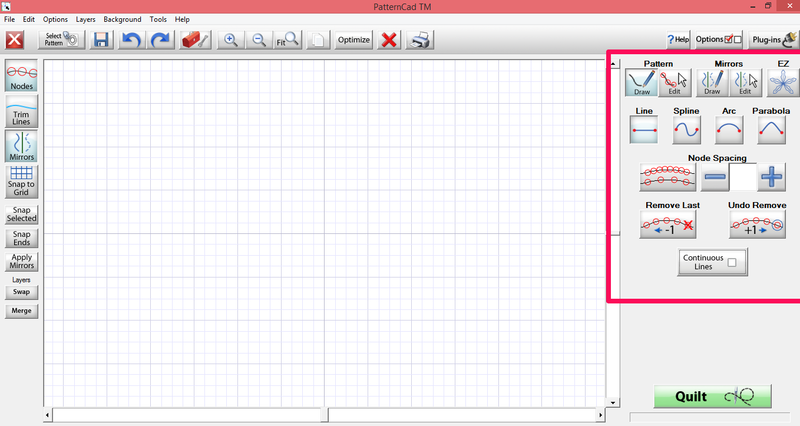 Over the next three weeks, we will be working in PatternCAD in the Pattern | Draw and Pattern | Edit features of the program. From the Home Screen under Design & Create tap on Pattern. On the right side of PatternCAD we will be working under the Pattern heading. 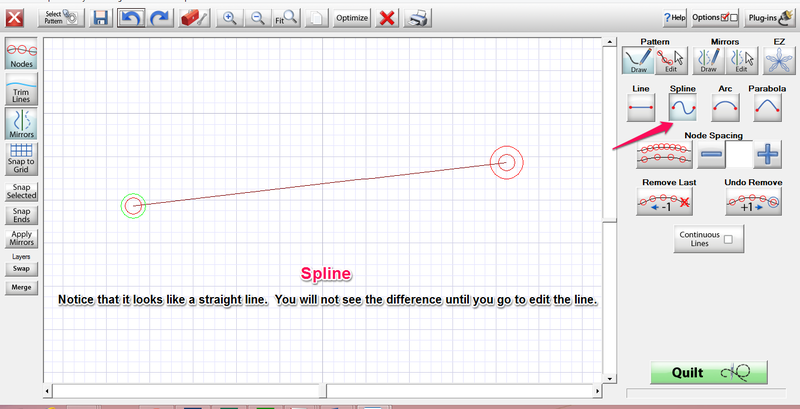 Today we will be covering the difference between a line and spline. Just looking at the buttons you can tell one is straight and one is curved, but they can look the same when you are not in edit mode. So, it is worth going over how to use both options. To draw a straight line. You want to tap on the Line button and have the Node Spacing button off. You can tell it is off because the will not be a number in the Node Spacing window. If you want to draw a curved line you would tap the Node Spacing button and then choose the amount of spacing you want between the nodes. Notice that the smaller the number is the closer the nodes are to each other. 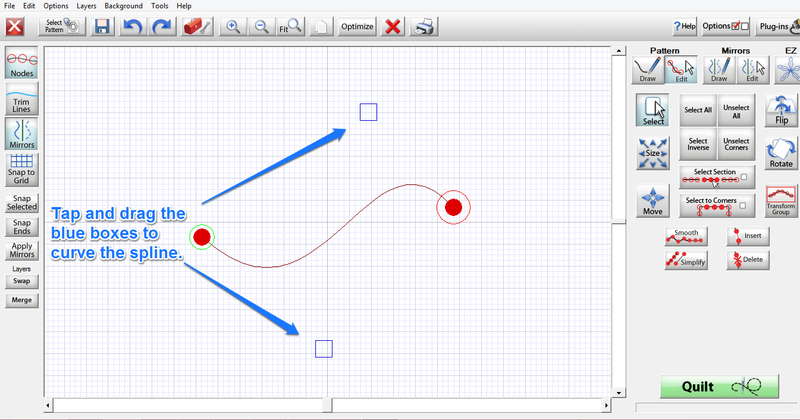 To draw a spline you will tap the Spline button. Notice that the Spline and the Line look the same at this point. You will not see a difference until you go to edit screen. To illustrate the difference I have put a line and a spline on the same screen. In the edit mode, I have selected all so that all of the nodes on the screen are highlighted. This will also cause two blue boxes to show up on the spline. 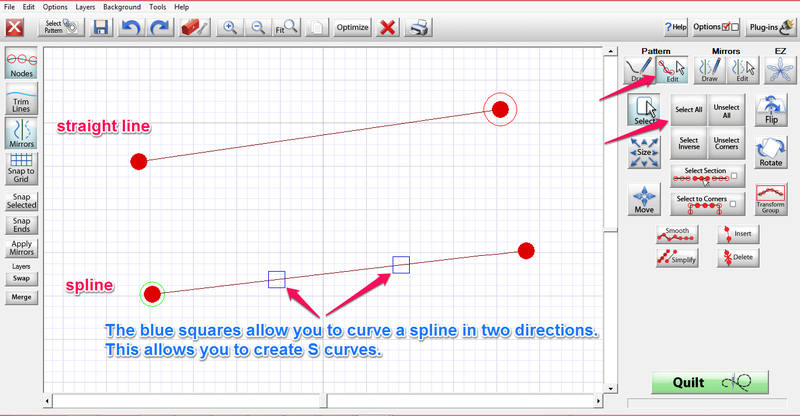 To make the spline curve you tap and drag the blue boxes. If you are making large changes in the spline you may need to zoom out to be able to move the boxes and get the curve you want on the spline. If you are editing a straight line and both of the nodes are selected, the entire line will move when you drag the line. 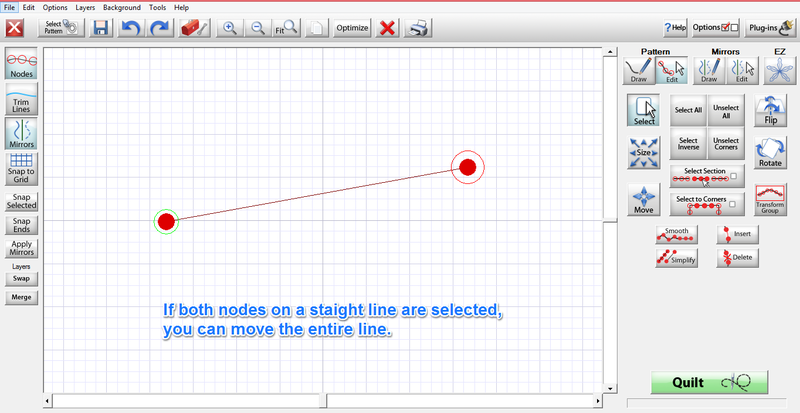 If you want to change the length or direction of the line, you will want to only select the node at one end of the line. 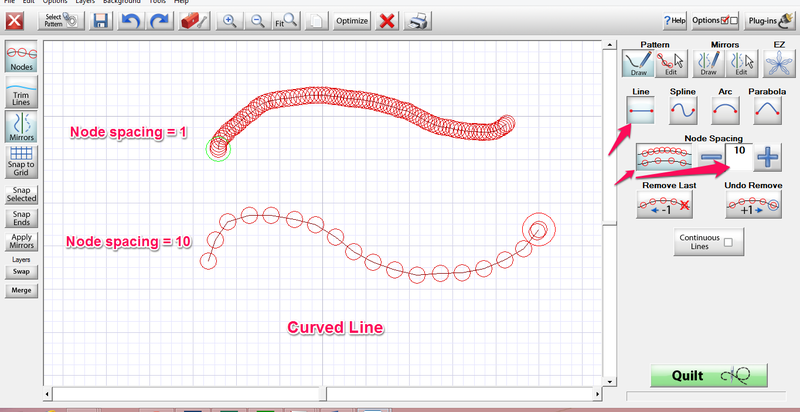 Editing of the curved line is more involved and will be covered in a future post. There are quilts on the walls!